» Articles » Trees » How 'bout Those Buckeyes!? Small trees or large shrubs—call them whatever you like, the buckeyes occupy a unique place in the world of landscape ornamentals. The buckeyes are members of the Horsechestnut family (Hippocastanaceae), which includes only about 20 species of trees and shrubs. These plants are found widely scattered throughout North America, parts of Asia, and in areas of southeastern Europe. Just a few of these, maybe 5 or 6, are actually native to the United States. 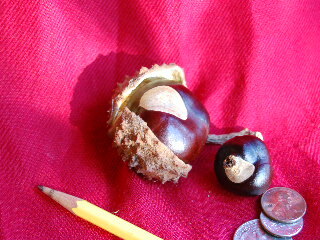 It is believed that the buckeye tree got its name from the American Indians, who thought the characteristic brownish seed with a small round coloration of lighter tan resembled the eye of the white-tail deer. The buckeyes are grown mainly for their handsome appearance in the landscape, although the creamy-white wood of the buckeye tree is somewhat important, being used in the manufacture of novelty items and furniture. Of the “full-tree” species of buckeyes, the Yellow Buckeye (Aesculus octandra) is one of the largest, reaching heights in excess of 90 feet with trunk diameters of 2 to 3 feet. The spring flowers of this tree are yellow in color and the leaves are dark yellow-green on the top surface and somewhat paler on the underside. This tree is similar to, and sometimes confused with, the Ohio Buckeye (Aesculus glabra), whose leaves are similar in their yellowish color but are of a more slender nature. And, even though the Ohio Buckeye has the same rounded-crown growth pattern, this tree usually does not reach heights exceeding more than 65 to 75 feet. A medium-sized member of the buckeye family, the Horsechestnut (Aesculus hippocastanum), is a handsome wide-spreading tree with a rounded crown. This tree is native to Asia and Europe, but has been imported to North America and is widely planted in the landscape as a desirable shade tree. It bears attractive white flowers in the spring and reaches heights up to 60 feet. 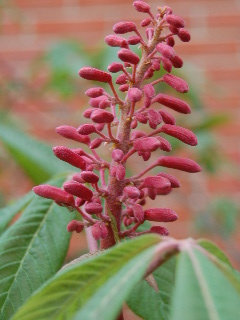 Most of the other buckeyes found in North America, the Painted Buckeye (Aesculus sylvatica), the Red Buckeye (Aesculus pavia), and the Bottlebrush Buckeye (Aesculus parviflora) are more shrub-like in appearance, reaching heights of only 10 to sometimes 25 or 30 feet and assuming more of a spreading growth habit than an upright “trunk and branches” growth pattern. All have characteristic brightly colored spring flowers (which add to their desirability as landscaping ornamentals), the Bottlebrush bearing pink flowers, the Painted bearing yellow flowers, and the Red buckeye, of course, bearing dark-red flowers. The buckeyes are not overly demanding, requiring only partial shade to full sun and reasonably well-drained moist soil in which to grow. The smaller varieties work well as shrub borders or, even more ideally, as stand-alone specimen plantings in beds of low-growing plants such as annuals or liriope. Their smooth gray bark, uniquely colored flower spikes, and pointed palm-like leaflets make them very unusual and highly desirable additions to your landscape.